I always look forward to my visit in early January to the Fells Burgundy tasting, as it is a welcome sign that Christmas is out of the way and the excitement of the New Year beckons (please don’t groan). 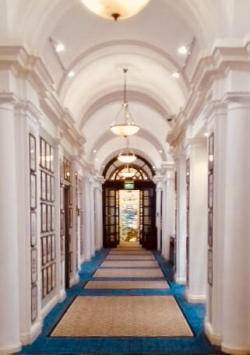 This year there was a change of venue for the tasting to the RAF Club in Piccadilly, and as the Service celebrated its centenary in 2018 so the Club was looking in very good nick. This was my first visit to the Club , as it would have been for a number of exhibitors, and although some aspects of it are very modern – a new stained-glass window commemorating the role of women in the RAF had been unveiled by HM The Queen in October 2018 – others were very ‘time-warp’. I had a strange urge to quicken my pace down a long corridor whilst humming the theme of ‘ The Dam Busters’. I also wondered, surrounded by so many portraits of Air Vice-Marshals and the like, whether I ought to have grown a handle-bar moustache for the occasion. However, once inside a very long room and having been greeted warmly by the lovely Isabelle, I was very much back in primeur 2017 tasting territory. I take my hat off to our suppliers Fells and Sons, as with Bouchard Pere and William Fevre they handle two of the oldest-established and most reliable domaines in North and South Burgundy. I began at the beginning, with No.1 on the Bouchard list which was a simple Pinot Noir “La Vignee”. But of course I use the word ‘simple’ very loosely, as there was much to entertain in a few gulps of this. I wrote in my notes that I could smell this all day : beautifully rich classic pinot on the nose and lots going on on the palate for around the £15 mark. 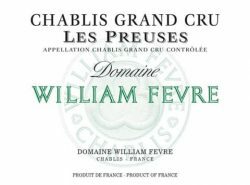 I then decided to move north to a Chablis from William Fevre, the Grand Cru Vaudesir, which remains one of my favourites, though in a higher price-band. I notice that immediately below this on the list is the Grand Cru Valmur, also oak-aged which I tasted some time later, and underneath that is the Grand Cru Les Preuses against which I had simply written ‘Blow your socks off!’ .This might have been after a swallowed glass or two of something quite fruity at lunchtime. All these are around £70 mark. This tasting was not just confined to the Bouchard and Fevre houses. Always able to surprise us, Fells have acquired the Champagne Henriot portfolio showing on the day, which includes the Beaux Freres vineyard in Willamette Valley, Oregon. Beaux Freres specialise in Pinot Noir, so it was logical to combine the tasting. It is quite powerful stuff : the Zena Crown Vineyard Pinot Noir has an ABV of 14.8% . This is something of a contrast to the average 12% in the Old World. Those of you wanting a bit of inside knowledge should note if you don’t know already that beaux-freres is French for ‘brothers – in –law’. 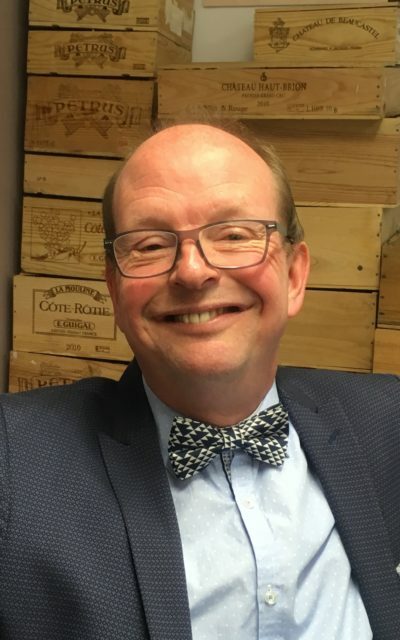 The founding owner and president of Beaux-Freres , Michael Etzel, purchased the vineyard with his brother–in –law, one Robert Parker Jr., So now you know. I was well advised to try a glass of Henriot Brut Millesime 2002 before I left, which is highly recommended and was the perfect end to another enjoyable day on the road. 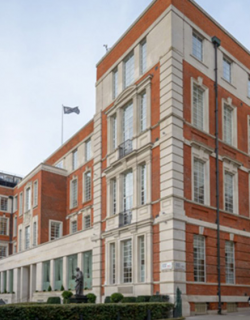 Just over a month later it was again my palate’s pleasure to be entertained by Fells and Co, this time with their full Portfolio Tasting at the Institute of Engineering and Technology (IET) on the Embankment. This time the wines came from all over the world, so your palate and your stamina needed to be honed for the occasion. Every wine producing continent in the world was there – so the M.O. is just to dive in! I first found myself next to the Spain and Portugal section and tasted a very appealing 2015 Priorat ‘Perpetual’ from Familia Torres. 70% Carinena and 30% Garnacha yield a good mix of spice and fruit, and an ABV of 14.5%, so quite a good place to start. I also tasted a 2009 Penedes from Jean Leon : ‘Vinya La Scala Gran Reserva’, which was 100% Cabernet Sauvignon and very dignified. Next I hopped over to South Africa to taste Vergelegen’s GVB 2012 Red, which is a lovely mix of mostly Cabernet Sauvignon and Merlot with a little Petit Verdot and Cabernet Franc thrown in to add more interest. This is special occasion wine and highly recommended. Italy drew me in next, and I tasted a 2016 entry level Barbera d’Alba DOC Battaglione from Renato Ratti which you could find around the £20 retail price point. 100% Barbera, lovely rich fruit matured in oak – great with a veal escalope! I’ve always preferred Barbera d’Alba to its sister Asti, as Asti seems to be everywhere. I then tried a 2014 Barolo DOCG Marcenasco,100% Nebbiolo matured in oak – and I can now say I’m beginning to ‘get’ Italian wine, why Barolo is so revered etc. This is a very fine wine and the grapes are distinguishable. I’ve always had difficulty with Italian grape varieties as the wine-growing areas are so concentrated, one runs into another and individual character to my mind becomes something of a blur. Not any more I am pleased to say! In any case, Burgundy and especially the Cote d’Or is comprised of tiny ‘parcelles’, all on top of each other but each with a different characteristic, and you’d never hear me say I had difficulty with them. Now we come to my Big Discovery of the afternoon, and the wonder is that it’s white! An entry-level 100% Riesling high up in the Eden Valley in Australia : Pewsey Vale Vineyard Riesling 2017. For added interest you could also look out for Pewsey Vale ‘The Contours’ Riesling 2012, aged in bottle for 5 years before release. These two could be found for around the £15 – £25 mark respectively. Those readers who know my slight bias towards ‘la belle France’ will have noticed that it hasn’t featured greatly so far. 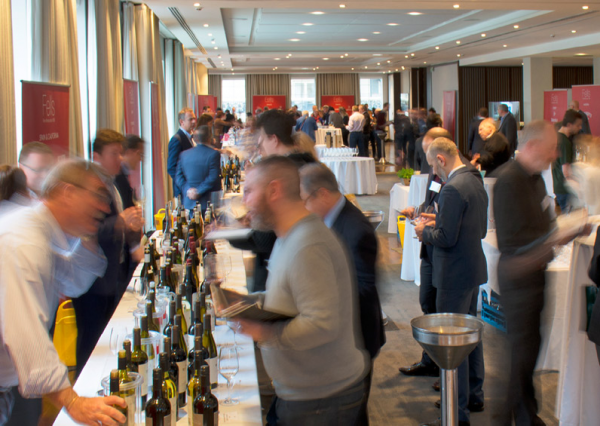 That is because the Fells Portfolio tasting tends to concentrate on the New World, and also that the Burgundies have largely been covered by tastings elsewhere (see above). However I did pay a visit to Alsace, to taste again a wine I’ve just bought a bottle of – Hugel’s 2016 ‘Gentil’. It is their only blended wine, a mix of 41% Sylvaner & Pinot Blanc, 19% Pinot Gris%, 18% Gewurztraminer, 17% Riesling and 5% Muscat. A real ‘pot pourri’ (well perhaps not trop pourri) of Alsatian sunshine. I finally called at the port stand and was poured a glass of Dow’s 20 year old Tawny by the chairman of Fells, Paul Symington. A fine end to a fine afternoon. I’m looking forward to next February already.